Watch world provocateur Maximilian Büsser of MB&F (the F in MB&F stands for Friends) delights in creating “impossible” pieces at seemingly impossible prices, and then immediately selling them out. Though you won’t see MB&F watches on anyone’s wrist unless you frequent certain places in Dubai or the most expensive nightclub in Paris, there’s no questioning the fact that Büsser and his many collaborators are boldly going where no watchmaker has gone before. The MB&F LM2 is essentially one of the most exclusive watches you can get your hands on if you can afford it. The epitome of beautiful and luxurious watches. His use of color is beyond bold, and he’s shown a distinct affinity for bright green as well as purple, a color long associated with royalty. “Obtained via a CVD (Chemical Vapour Deposition) process, many watchmakers avoid using purple because the color isn’t stable,” Büsser notes, “changing from purple to blue to green depending on the light. 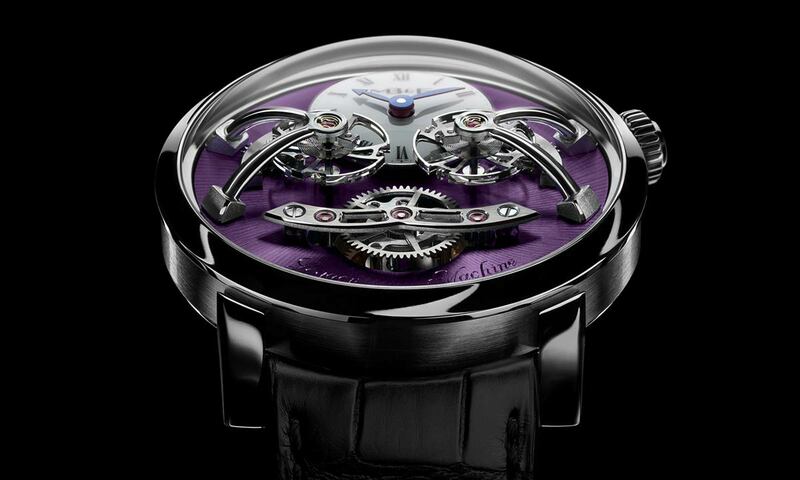 To us, just makes it even cooler.” Purple has popped up before in MB&F’s HM3 Frog Zr, HM5 CarbonMacrolon, HM8 Only Watch, HMX Black Badger and LM Perpetual. Now the Legacy Machine No. 2 (LM2) is getting the royal purple treatment. The LM2 is certainly favorable when compared to the MB&F HM9 that we previously mentioned with the exception to the price tag. 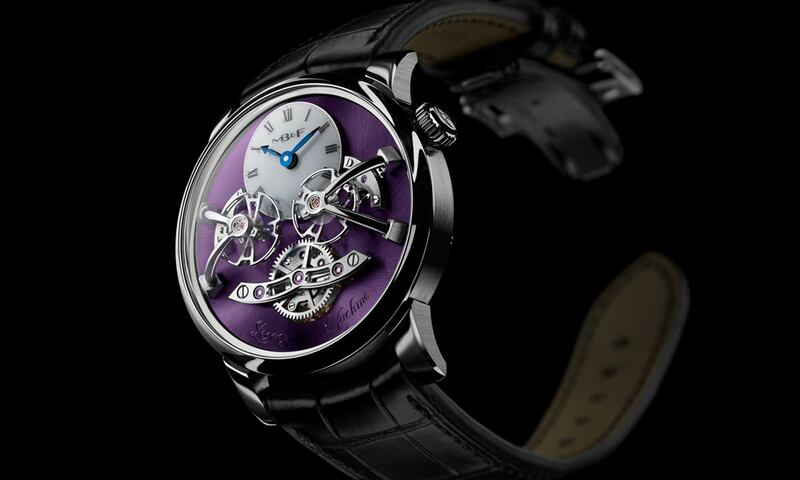 The LM2 White Gold Purple will be limited to just 12 pieces for collectors worldwide, priced at $159,000 apiece. The difficult to obtain color covers the entire face of the watch, “serving as a powerful backdrop to the equally unconventional LM2 movement,” conceived by watchmakers Jean-François Mojon and Kari Voutilainen and featuring two fully independent flying wheels and escapements “constantly averaged by a central planetary differential.” The LM2 was originally conceived as a tribute to some of the greatest watchmakers ever including Breguet founder Abraham-Louis Breguet (1747-1823). Yet another way Büsser and co. manage to honor the past while forging the future.